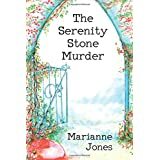 “The Serenity Stone Murder” is a cozy mystery about two elderly women, Margaret and Louise, who attends a spiritual retreat, only to find themselves in the midst of a murder. I found the characters were very well developed, especially the lead women. They are two unlikely friends who find themselves at odd with one another, but never for long. Margaret and Louise have a brief falling out when Margaret is upset by the accommodations they find after they are denied their room at the inn. The inn has a strict no pets policy and Louise refuses to board her dog, Vincent. In addition, Margaret is only along for the ride, deciding to use her time away from home by exploring the town and its surroundings. Like most of their retreat companions, Margaret and Louise are busybodies, eager for gossip. What I most identified with was Margaret’s desire for coffee, and the annoyance when she can’t find anything except herbal tea. The pace of the story was slow, a bit too slow for me. The murder didn’t happen until the end of the second chapter, and I was wondering when someone would turn up dead. However, aside from that wondering, Marianne Jones does a good job at building the scenes and the characters. I only wish the murder had happened earlier in the story. The story is a decent tale if you have time to lay back and read leisurely. It was well-written and can be a fun read with patience. I enjoyed the women’s bickering the most in the story, but building up to the murder itself was somewhat weary for my tastes. There were no real reasons as to why Margaret and Louise chose to investigate the murder, except for curiosity and the desire to snoop. It would be interesting to see additional cozies with these two ladies finding themselves in the midst of other murders. Marianne Jones is a retired teacher, actor, and choir director from the wilds of Northwestern Ontario. Married, with two amazing daughters and two gorgeous granddaughters, she writes, blogs and celebrates life. Although not all her words are carved in stone, three of her poems are, in permanent installation at Prince Arthur’s Landing at Marina Park in Thunder Bay. Nicely written review–honest succinct and thorough. How does one request a book review on this site? ?